Let's pop the cork and raise a glass (and a bacon lollipop) to another year. Another year is coming to a close, and soon we'll celebrate the arrival of 2012 with friends, family, sparkling wine and tasty party foods. For those hosting a party large or small, a buffet of flavor-packed, bite-size morsels will keep your guests satisfied while cutting down on your time in the kitchen. When we asked her for a crowd-pleasing New Year's Eve appetizer, Tamara Reynolds, caterer, co-author of Forking Fantastic: Put the Party Back in Dinner Party (Gotham 2009) and a regular on the Cooking Channel's Unique Eats, shared her recipe for Candied Bacon Lollipops. "This will be the easiest, most worshipped canapé you'll ever make," said Reynolds. "People flip their lids for bacon in general, but when you candy it with brown sugar and then pop it on a skewer, watch out. And, the viscosity and salty-sweet balance of the bacon makes it a perfect match for a fuller-bodied sparkler, or one with spicy, citrus or tropical fruit notes." To that end, we've put together a list of 15 recently rated sparkling wines, below. Cheers to a happy and healthy 2012! Expect these tasty and aromatic bacon lollipops to disappear quickly from your New Year's Eve buffet. 2. Using a very sharp knife, remove and discard any skin on the bacon, taking care not to remove fat or meat. 3. Cut the bacon into 1-inch cubes, bearing in mind that pieces should be large enough to skewer, but small enough to be consumed in a single bite. 4. Combine the bacon and sugar in a large bowl and toss gently to coat the surface of the bacon with the sugar (there will be excess sugar). 5. If using a silicone baking mat, place it on a baking sheet, then distribute the bacon pieces and excess sugar evenly on the mat. Otherwise, distribute the bacon pieces directly on the baking sheet. The brown sugar will melt in with the bacon fat that breaks down. 6. Place the baking sheet in the oven and check after 10 minutes. The bacon should be cooking, and the sugar melted and caramelizing with the bacon fat. If it looks too spread out, or like it is burning at the edges, use a spatula to move the bacon pieces and excess sugar to the middle of the pan. Cook until done, about 3 to 6 minutes more. 7. Remove from the oven and let cool five minutes before serving. This is very important: Hot sugar will burn your guests' mouths. Thread the bacon pieces onto the skewers, arrange in the jar, and serve. Serves 10 to 15 as a canapé. Note: The following list is a selection of outstanding and very good wines from recently rated releases. 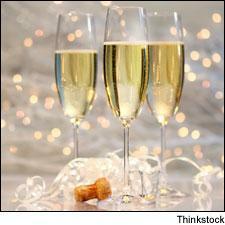 More Champagnes and sparkling wines can be found in our Wine Ratings Search. There's a firm, chalky edge to this minerally Champagne, and mouthwatering flavors of candied lemon peel, green apple, crystallized honey and biscuit. This has an elegant texture and an overall sense of style. Drink now through 2020. 50,000 cases made.—A.N. Offers hints of Jonagold apple, apple blossom, biscuit and ginger, with a focused structure. Lightly juicy, with a subtle texture and a touch of honey on the finish. Drink now through 2016. 12,000 cases made.—A.N. Sleek and vibrant, with floral apple and lemon aromas and crisp, complex flavors of pear and yeasty cinnamon that linger toward the minerally finish. Drink now through 2015. 20,500 cases made.—T.F. Focused by solid acidity, this shows subtle biscuit, green pear, lemon curd and stone notes. Fresh and lightly juicy, with a hint of black licorice on the finish. Drink now through 2018. 11,000 cases made.—A.N. Bright aromas of green apple and lime lead to vibrant, layered flavors of citrus, anise and creamy vanilla. Drink now. 25,000 cases made.—T.F. Crisp and lively, with aromas of green apple, cinnamon and vanilla that lead to appealing flavors of tropical fruit and spicy anise. Drink now through 2014. 200,000 cases made.—T.F. Rich and youthful, with delicate aromas of green apple and lime that lead to full flavors of baked pear and toasty anise, laced with cinnamon. The finish is clean and crisp, with a hint of mineral. Drink now. 80,000 cases made.—T.F. Crisp and festive, with strawberry and vanilla aromas and vibrant flavors of cherry, watermelon and spiced graham cracker. Drink now. 20,610 cases made.—T.F. Floral aromas of apple and strawberry lead to crisp, easygoing citrus, cinnamon and spiced nut flavors. Drink now. 65,345 cases made.—T.F. Soft and easy to like, offering spicy cherry and vanilla aromas that lead to slightly sweet strawberry and citrus flavors, with a crisp finish. Drink now. 50,000 cases made.—T.F. Snappy and appealing for its fresh apple and Meyer lemon aromas that lead to ripe, juicy tropical fruit and cinnamon spice flavors. Drink now. 75,000 cases made.—T.F. A festive bubbly, with baked apple pie aromas and easygoing, zesty lemon tart and yeasty cinnamon flavors. Drink now. 30,500 cases made.—T.F. Crisp and lively, showing aromas of lemon curd and white chocolate, with vibrant flavors of baked apple and spiced nuts. Drink now. 130,000 cases made.—T.F. This spicy sparkler delivers a bright mouthful of clove, lime and pineapple flavors. Something hints at tequila as the finish lingers. Drink now. 191,540 cases made.—H.S. There's a savory edge to the apple pastry, ginger and almond cream flavors in this well-cut and focused cava. The mouthwatering finish is tinged with smoke and nut notes. Drink now through 2015. 300,000 cases made.—A.N. I made the Bacon Lollipops as one of the dishes at our New Years Tapas Party; these things were absolutely fantastic!